Haifa is not Gaza - Geography lesson for Hamas supporters | Petition: Hamas leaders to trial for War Crimes - SIGN! So, we all know that Pallywood is the world’s largest cinematic and fiction provider. They are getting better and better but it is still pretty obvious. It’s rather easy to point out the Photoshop images, the fake blood, the directed movies because the pallywood producers and their little helpers in western media do everything to make the world see and publish their creation. But it’s not always easy to catch downright stupid people who use their private social media networks to spread lies. This guy urgently needs his eyes checked and a lesson in Geography as he posted an image of Haifa saying it is Gaza. 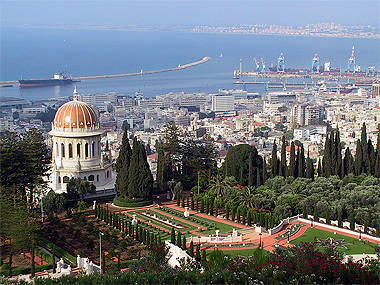 Well Haifa still stands thank you very much for asking, and it still stands as a symbol of co-existence. So feel free to flood this guy’s twitter with lessons. A litle education never hurt anyone!